May 22, 2011 - The Office of Inspector General plans to conduct a follow-up review of Federal Aviation Administration (FAA) and industry efforts to enhance safety in response to the 2009 fatal crash of Colgan Air flight 3407. OIG will conduct this review at the request of the Ranking Member of the House Committee on Transportation and Infrastructure and the Ranking Member of the Subcommittee on Aviation. Several safety initiatives were introduced following the Colgan Air crash through FAA?s Call to Action on Airline Safety and Pilot Training and subsequently became requirements under the Airline Safety and FAA Extension Act of 2010. Effectively implementing these requirements in a timely manner is critical to enhancing safety for the traveling public. Accordingly, OIG audit objectives are to examine the FAA and industry progress in implementing elements of the Act and identify any challenges to completing these actions. Colgan Air Flight 3407, marketed as Continental Connection under a codeshare agreement with Continental Airlines, was a daily U.S. regional airline commuter flight from Newark Liberty International Airport in New Jersey to Buffalo Niagara International Airport in New York State. 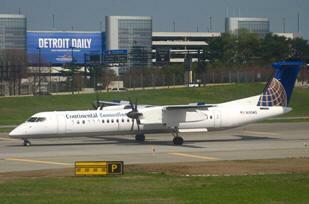 A Bombardier DHC8-402 Q400 operating as Flight 3407 departed late from Newark on February 12, 2009, at 9:20 p.m. EST. Shortly after the last communication by the flight crew with approach control at 10:17 p.m. (03:17, February 13 UTC), the plane stalled less than a mile northeast of the locator outer marker while on an ILS approach to Runway 23 and crashed into a house in the northeast Buffalo suburb of Clarence Center, a hamlet and census-designated place in the Town of Clarence, about 9.3 kilometres (5.0 nmi) short of the runway threshold. A total of 50 people were killed including the two pilots, two flight attendants, 45 passengers (including one off-duty pilot), and one person in the house into which the plane crashed. It was the first fatal crash of a commercial airliner in the United States since the crash of Comair Flight 191 in August 2006 which killed 49. The National Transportation Safety Board concluded that cause of the crash was pilot error. The aircraft had been cleared for the ILS Runway 23 approach to the nearby Buffalo Niagara International Airport when it disappeared from radar. Weather conditions were a wintry mix in the area, with light snow, fog, and winds at 17 miles per hour (15 knots). Two other aircraft reported icing conditions around the time of the crash. The last radio transmission from the flight occurred when the plane was 4.8 kilometres (3.0 mi) northeast of the airport radio beacon known as KLUMP (see diagram), when First Officer Shaw acknowledged a routine instruction to change to tower frequency. After several attempts to hail the crew, controllers requested the assistance of Delta Air Lines Flight 1998 from Atlanta, GA and US Airways Flight 1452 from Charlotte, NC to make visual contact with the missing airplane; the Delta crew members responded that they did not see the plane. During the flight and continuing through the plane's landing approach, the crew had been flying on autopilot. The de-icing system was turned on 11 minutes into the flight by the crew, who had discussed significant ice buildup on the aircraft's wings and windscreen shortly before the crash. Following this, the pilots extended the aircraft's flaps and landing gear for landing. According to the NTSB's official report, after the landing gear and flaps had been extended, the flight data recorder (FDR) indicated that the airspeed had decayed to 145 knots (269 km/h). The captain, who was the pilot flying, then called for the flaps to be set at the 15 degree position. As the flaps transitioned past the 10 degree mark, the FDR indicated that the airspeed had further slowed to 135 knots (250 km/h). Six seconds later, the aircraft's stick shaker, a device intended to provide aural and tactile awareness of a low speed condition, sounded. At this time the cockpit voice recorder (CVR) recorded the autopilot disengaging. The FDR now indicated that the aircraft's speed was a dangerously slow 131 knots (243 km/h). Unfortunately, instead of following the established stall recovery procedure of adding full power and lowering the nose to prevent the stall, the captain only added about 75% power and continued applying nose-up inputs. As the aircraft came even closer to stalling the stick pusher activated. The stick pusher is designed as a last ditch effort to lower the airplane's attitude to fly out of the stall. The captain overrode the pusher and continued pulling on the control yoke resulting in the upset and subsequent loss of control. The plane pitched up at an angle of 31 degrees in its final moments, before pitching down at 45 degrees. It then rolled to the left at 46 degrees and snapped back to the right at 105 degrees. Occupants aboard experienced forces estimated at nearly twice that of gravity. Witnesses on the ground claimed to have heard the engines sputter just before the crash.